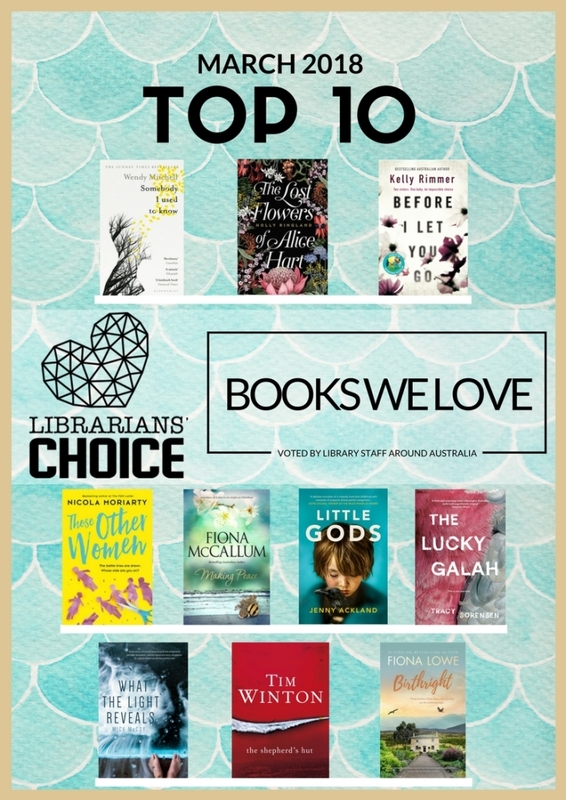 The top 10 March 2018 release books as voted for by library staff around Australia is here. There are some by some well known favourites such as Tim Winton, Nicola Moriarty and Fiona McCallum as well as some lesser known talents. Click on the title to reserve a copy now. Alice survives a devastating family tragedy when she is just 9 years old, then goes to live on a flower farm where she learns the language of Australian native flowers – a way to say the things that are too hard to speak. The story celebrates Australia’s beautiful landscape, moving between the lush sugar cane fields by the sea, a native Australian flower farm, and a celestial crater in the central desert. Your sister needs you. But her child needs you more… A moving page-turner with a heart-pounding dilemma: Your sister or her baby. Who do you choose? What do you do when your sister, an addict, tells you she’s pregnant and needs your help? Is an inheritance a privilege or a right? Does it show love? Does it give security? or does it give freedom? As a mother’s health deteriorates, will long-held secrets and childhood rivalries smash a family into pieces? An addictive and page-turning story of the relationships between siblings and of deceit, betrayal and revenge. An online rivalry between mums and non-mums spills dangerously into the real world. A rivalry that was once harmless fun is spiralling out of control. Because one of their members is a wolf in sheep’s clothing. And she has an agenda of her own . . .
An Australian family living in Moscow during the Cold War. Where is home, what is a family and what does it mean to belong? What can be revealed and what is better concealed? A novel about secrets and lies, guilt, loyalty and betrayal and the urge for survival. Jaxie dreads going home. His mum’s dead. The old man bashes him without mercy, and he wishes he was an orphan. But no one’s ever told Jaxie Clackton to be careful what he wishes for. In one terrible moment his life is stripped to little more than what he can carry and how he can keep himself alive. There’s just one person left in the world who understands him and what he still dares to hope for. But to reach her he’ll have to cross the vast saltlands on a trek that only a dreamer or a fugitive would attempt. A magnificent novel about fate, Australia and what it means to be human… it just happens to be narrated by a galah called Lucky. It’s 1969 and a remote coastal town in Western Australia is poised to play a pivotal part in the moon landing. Perched on the red dunes of its outskirts looms the great Dish: a relay for messages between Apollo 11 and Houston, Texas. This entry was posted in Australian Authors, Fiction, Non Fiction, Recommended Reading, Staff Favourites and tagged recommended reading, Staff picks by Parra Reader. Bookmark the permalink.